Below we review our 5 favorite heavy duty sewing machines you can find today. for the past few months as well as the Singer 4423 (more on that later). For me, the Janome 3000 is the best heavy duty sewing machine in the under $400 price range. It has the ease of use that’s perfect for a beginner and the features that a true seamstress will love. However, the other machines on this list are great alternatives if the HD3000 doesn’t meet your needs or budget. If you’re like me, you want a machine that is easy to use yet comes with all of the features needed for an advanced stitch. Borrowing this machine from a friend, I have been testing out this model for months and found that one feature really stands out to me: the 7-piece feed dog. Feeding fabric with any sort of precision requires a steady hand and a lot of concentration. But, the HD3000 takes control with the 7-piece feed dog. When selecting your desired stitch, you’ll be able to choose between 18 stitches plus a one-step buttonhole. There is a stitch length and width adjustment available, which makes life a little easier. Right on the front of the unit, you’ll find all of the stitch options along with a visual representation of the stitch. For a beginner that may confuse one stitch from another, the visual diagram is a major help. If you’re making bags, you can switch to the Triple Strength Stitch, which is extremely tight and durable – perfect for bags. The Tricot Stitch is another favorite of mine and produces 3 stitches for zigs and zags. Want to make something a little thicker, such as a sash cord? Perfect, but you’ll need a machine with an adjustable presser foot. Normally, you won’t need to change the pressure often, but when stitching through thicker material, like upholstery, leather or denim then you’ll need less pressure for an easier sew. This model has an adjustable presser foot that is perfect for scarves, jeans, shirts, socks and anything else you would want to sew. Tension control is done manually, and there is an easy reverse button for reverse stitches. Click here to see a list of our favorite quilting machines in 2018. Janome states that they make the world’s easiest heavy duty machines to use. Are these claims true? I don’t know for sure for all of their models, but the HD3000 is a breeze. First, there is a lot of room to store your items, such as extra feet or needles, thanks to the storage compartment. This allowed me to get through projects faster because all of the feet, needles and thread I needed was just a few inches away. Digital models are nice, but the display can break or the text can be hard to read at times. I am a little old-fashioned and prefer dials – which is what the HD3000 uses. Large and easy to read and move, everything from the thickness to the stitch type is controlled using dials. Have trouble threading needles? You’re not alone. This machine comes with a built-in needle threader. Thread is threaded front to back. You won’t be able to see the eye of the needle, but you won’t need to. There is even a built-in thread cutter, so you don’t have to go around the house trying to find a scissor when you’re ready to switch threads. Speaking of thread, the automatic bobbin winding will neatly and evenly wind thread for you. The see-through drop-in bobbin plate will let you see the amount left on the bobbin, so you can anticipate when it will run out. From a usage point of view, all of these little features allow you to sew faster and more efficiently. Janome included a hard case, which is great for carrying it around. However, the case is designed to simply cover the machine and allows the machine’s handle to be on the outside of the case. While it is not ideal, the case works just fine and you can buy another one if you like. I’m just trying to be a little nitpicky, so you know what to expect from the Janome HD3000. The foot pedal does slide on wood or tile floors, but they all do. Easy to use and very sensitive, I recommend putting non-slide pads on the bottom of the pedal for added traction. One final aspect I want to mention is that this machine is very quiet. It’s safe to say that this model produces less noise than most small appliances – or children – for that matter. The lightbulb is also very bright, so you won’t have any issues when sewing. I am going to be completely honest: the Janome HD3000 is worth every last penny. It is a more expensive model, but it is the best heavy duty sewing machine for the price. I guarantee that you won’t be disappointed. I could go on and on about the Singer 4423, but this is simply an alternative to the HD3000. The Singer will get the job done, but it is not as durable, easy to use or as robust as the HD3000. However, it is half the price. Brother’s ST371HD is a mid-priced model, and it even won the Women’s Choice Award in 2018 with 9 out of 10 customers recommending this heavy duty sewing machine. Providing the power and durability that only Brother can offer, this model is a great buy with a true heavy-duty design. Easy-to-transport, this model has a built-in handle that allows it to be picked up from the closet and placed right on a sewing table. The chassis is made of metal, and the purpose for this metal is to offer stability and consistency in your sewing projects. Metal will provide a heavier weight, but the sewing machine is far sturdier than the competition as a result. A metal needle plate has been incorporated into the design, and it’s done on purpose. The metal plate helps improve the thread pickup speed and also protects the threading mechanism. Strong and tough, users will be able to change between all of the 37 stitches with the turn of a knob. The front right of the machine has all 37 stitches neatly displayed so that users always have a stitch reference right in front of them. The unit comes with #16 needles to work through heavyweight fabrics. Buttons are easy to create with the auto-sized buttonholes that feature a one-step design. Add buttons to any project with ease, and you’ll even be able to add buttons to thicker fabrics. The ST371HD can sew through multiple layers of canvas, burlap, jean and other thicker fabrics without any issues. Threading is done with the touch of a lever, and the unit will push the thread right through the needle saving you time and frustration every time you want to sew. Six versatile feet are included, and they all feature the snap-on design for ease of use. The feet are nonstick, and there is a spring action zigzag foot included, too. Fast and efficient, this is the sewing machine that you’ll pull out of the closet when you need a project to last. The stitches are tight and offer a sturdy garment that won’t unravel. When a project is complex or uses thick materials, there won’t be any issues with the Brother ST371HD. Singer’s Heavy Duty 4411 is a model I have owned for nearly three years, and it’s a great compromise in price for slightly less features. You’ll also be able to enjoy a powerful motor for most project needs. Singer has a lot of different packages offered, including just the machine, and then models that come with a tote, roller bag or carry case. Keep these options in mind if you need a case for your sewing machine. You’ll be able to make everything from new clothing to home décor and even crafts when using the 4411. Needle position is adjustable, so you’ll be able to adjust between three different needle positions at any time. Why is this important? I find myself adjusting between positions often when adding zippers into a project or adding in those final, decorative touches into a project. Pressure feet have adjustable controls to allow you to ease the pressure for heavy fabrics and apply more pressure for lightweight fabrics. The frame is made from metal, and a stainless-steel bedplate is also present. These two features, along with the powerful motor, help the 4411 sew through a wide range of fabrics with ease. Built-in reverse, a 4-step buttonhole, adjustable stitch length and width and a plethora of accessories come with this model. It’s a great, overall sewing machine that has been built from the ground up to exceed user expectations. You’ll be able to get started sewing faster with the 4411, and for me, this is perfect because I rather spend more time sewing than fussing with settings. Singer has also included a sewing assistance app, which is something that I don’t believe I received when I ordered this sewing machine years ago. 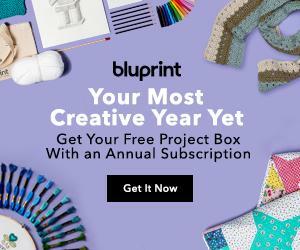 The app is there to assist you with your sewing projects, and it includes everything from helping you learn new sewing techniques to tutorials that are available at your fingertips. The app is a great addition, and it’s available on iOS and Android, so it should work with your phone. 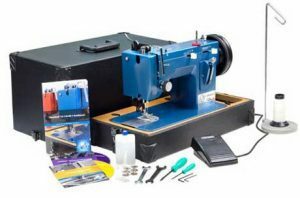 The first two machines are great and perfect for most people who are looking for a powerful sewing machine for their how. However, if you are someone who consistently works with multiple layers of heavy material like sailcloth, denim, leather, upholstery or dacron then the Sailrite LSZ-1 is the machine for you. The LSZ-1 is a tried and true workhorse. I’ve seen people go through 10+ layers of denim on it with ease. The extra wide presser foot and piping tunnel help to guide your material through. Sailrite machines come with a patented Posi-Pin clutching system that provides consistent power from the balance wheel to the needle so you never have to worry about getting jammed up while working. It is a basic straight stitch/zigzag walking foot machine that is built for simplicity and power. It’s very easy to setup and use and comes with an instructional DVD to help you get started. If you are interested in this machine and want to learn more you can see our full review of this machine here. Even when quilting, I have found the HD3000 to work like a charm. With commercial machines, many models simply can’t be used for quilting, but this model can. I think I have raved enough about this Janome model. It’s fast, powerful and easy to use from start to finish. The 18-stitch options are more than enough for making something simple like a scarf or hemming pants, while tighter stitches are perfect for jeans or bags that need strong stitches. Every time I’ve used the HD3000, it has performed flawlessly. As long as you follow the chart below you won’t have any issues with this machine. I’ve sewn pants, shirts, hemmed pants, sew through denim, repaired a sash cord and probably forgot to mention a few other projects that I forgot about. In all, if I had to choose one make and model that is meant for heavy duty use, it would be the HD3000 – hands down. It provides the reliability of a commercial machine at an affordable price. 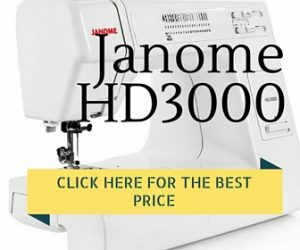 => Click here to find the best deals on the Janome HD3000 on Amazon. 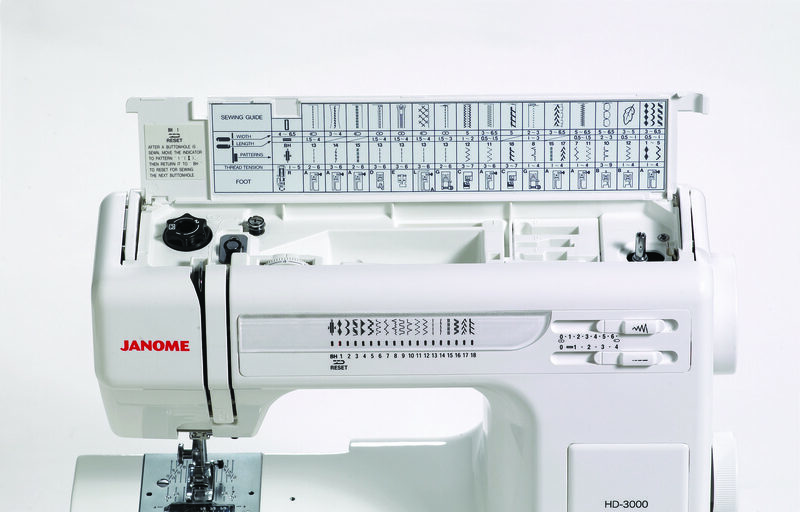 9.4 tech score The Janome HD3000 is easy to use, can handle many layers of fabric and its durability is amazing with all internal working parts made of metal. This workhorse is perfect for the at-home sewer who likes to take on larger, more demanding projects. Pingback: Which is the Best Sewing Machine for Quilting? Pingback: Are Hello Kitty Sewing Machines Any Good?